I get a slew of questions whenever someone finds out that I live in a camper that totals 350 sqft with a grown man and three dogs. Today I thought I would tackle how to downsize to a tiny house. Before we moved to the DFW area, we lived in Tulsa in a 2,800 sqft house. I loved the house because it was built in the 1970s and had a funky shag rug feel. But it was too much house for just the two of us. When we moved to DFW, we decided to move into something small and rented a 1,800 sqft house. I still felt it was too much house. We had bedrooms we weren’t using but I still had to clean. That is when we started following and researching tiny house living, and when our lease was up, we took the plunge. 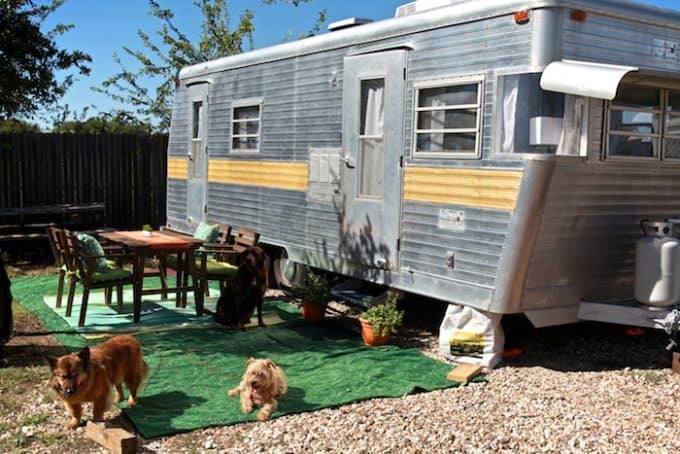 For the first eight months, we lived in our vintage camper, which was a whopping 150 sq ft. Yes, two grown adults and three dogs, one of them a lab, in 150 sq ft. It’s a miracle we made it eight months. 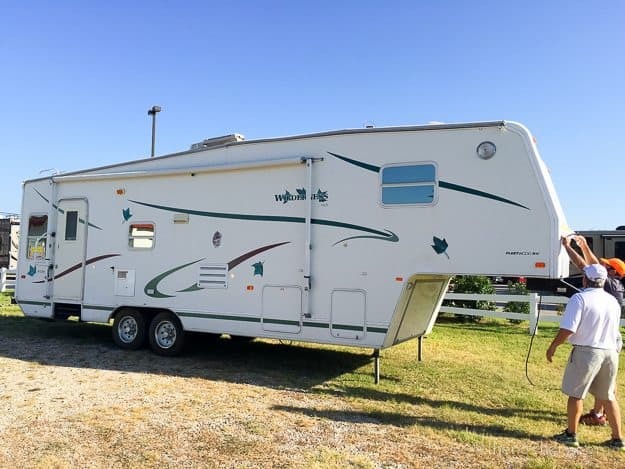 We upgraded to a fifth-wheel camper, which is approximately 350 sqft, and we love it! We finally found the perfect size for us. All this to say I have some experience when it comes to downsizing. Today I am going to share a few tips for downsizing to a tiny house. But these tips can be applied to just downsizing. Regardless if you’re moving from 3,000 sq ft to 1,400 sq ft or 350 sq ft, these tips will come in handy. Items that are important to you and cannot be replaced. Think family photos, important documents, and things you require for your work. For example, in my case, my laptop and camera are must haves and cannot be replaced except to upgrade them. These are things you can sell, donate or simply get rid of some way. Are these things you have to get rid of? Now, I tend to be a little overzealous and follow the philosophy “get rid of all of it” but, if space starts to get tight these are the first to go. Evaluate what items you currently own and could be sold and replaced with a smaller version. For example, your 50-inch television could be sold and downsized to a 25-inch television. Sell your oversized furniture for furniture that better fits the space. Choose furniture that can be multipurpose like a sofa with a pull-out bed or end tables and coffee table with hideaway storage. Also on this list, include the twenty mixed and match plates or glasses that could be sold and replace with a smaller number of new plates or glasses. Selling has never been easier! With technology, there are more ways and easier ways to sell our unwanted items. It feels like Craigslist has been around forever, and for a long time, it never changed. Now Craigslist is more searchable, easier to browse and even available as an app on smartphones. Craigslist is where most people start when looking to purchase or sell items. I recommend posting not only a garage sale or estate sale ad but also ads for your larger, higher-priced items such as electronics, furniture, camping equipment and automobiles. Within the individual ads, mention that you will be having a single sale and that they can purchase it then. If you want to meet people individually for these items, it’s up to you, but I encourage you to consolidate your time and encourage them to come to the sale. OfferUp and Wallop are selling ads that are kind of like Craigslist but better. These apps link to Facebook profiles so you get a confirmed image and name of the buyer. The buyers and sellers can be rated so you know if they can be trusted. Also, the app is designed to facilitate bartering without having to exchange emails or phone numbers. Once you approve an offer, the item is listed as sold. This is perfect for me because I never seem to remember to remove a Craigslist post. How many times have you had a garage sale or something and someone says that they don’t have enough cash? Get a Square! If you’re not familiar with Square, it is a small device that connects to your smartphone through the headphone jack. It works with both iOS and Android. You sign-up for an account and link a bank account, and you are able to take both debit and credit card payments. They do charge a small 2.75% per swipe. If you don’t have a signal, no worries. The app will store the data and sync it once you connect to a signal. So no matter where you are, you can accept payments. I had multiple people come to my sale and keep buying because I accepted debit and credit cards. After you have determined all the items you want to sell and packed those you wish to keep, have an estate sale. An estate sale is typically done in the house. This way you don’t have to be dragging furniture in and out of the house and the sale is not at the mercy of the weather. I also found this very helpful because I was able to stage certain items, which helps the buyer picture them in their own home. Of course, if you choose to do this, take all safety precautions. Clearly label doors where there are no items and you don’t want people to enter. Have more than one person help you with the sale and keep an eye on people and rooms. We did this after we had moved into our tiny house. Really consider how many you need of a certain item. For example, I have a rule that I only have enough plates, glasses and utensils for my husband and I and two guests. So, in my kitchen, I only have four plates, four sets of flatware and four drinking glasses — no more, no less. If the time comes where I need more, I use disposable items. The same practice can be applied to multiple categories like towels, bedding and clothes. My general rule is one for each member of the house and one to swap. Replace the items as they wear down. When you live in a big house, there is room, a closet, and probably multiple drawers that you have just for stuff. When living a tiny house, you may get a single drawer if you’re lucky. 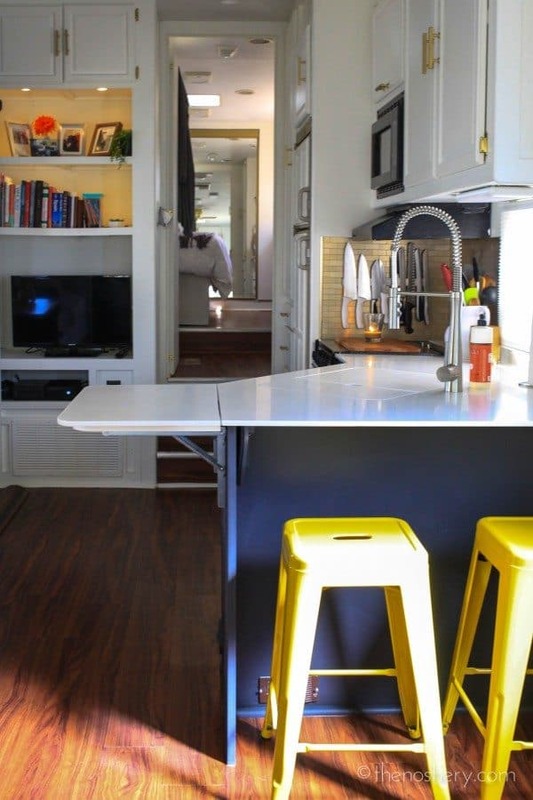 You have to be creative with storage when moving into a tiny house. Think baskets, boxes, containers and vertical storage. When deciding what you’re going to keep, also visualize where it’s going to go. For everything you decided to keep, you also need to know its place. With technology, it may never be easier to live in a tiny house. Now things are smaller, faster, and better performing. Really focus on how to go paperless and switch to e-books. The giant sound system can be scaled down to a small Bluetooth speaker. Anything that can be wireless controls clutter. These things don’t need to take up valuable space anymore. Downsizing doesn’t mean you can’t have a storage unit. We have a storage unit but we use the same evaluation practices with our unit as we do with our tiny house. We use the storage unit mainly for seasonal clothes, camping gear, bikes, tools and a few mid-century furniture pieces I am not ready to sell. If you need a storage unit, organize it so it’s easy to access, like a warehouse. If you just stuff it from floor to ceiling like most storage units, it will be a waste of storage. All valid points. Even if I’m considering it myself at the moment, storage options are limited and I still need to get extra creative. i am thinking to get a camper van, but costly, but it is one of the best home in this world which makes life movable from one traveling destination to other.thanks for sharing valuable information. A tiny home – perfect home space optimized with every possibility to enjoy a beautiful life. i am thinking to get a camper van, but costly, but it is one of the best home in this world which makes life movable from one traveling destination to other. Question, are you still planning to build a tiny house someday, or is this “the one”? We downsized from 3500 sq. feet to 1100…..best. decision. ever. I knew as soon as I moved into a large home years ago (having went from a mobile home to my “dream home”) that I should have went small. That started my “little bitty dream home” dream. A divorce and remarriage later, I inherited another huge home. It took a lot of convincing to get the hubby on board, but boy, is he happy now! We even did the whole buying before selling thing. NOT for the faint of heart. We moved in before Christmas, it has been magical. So I just wondered, are you still on a path to build small? Or would small now be “too big”?! Thanks!